Defy Hardwood Deck Stain was developed to penetrate dense exotic woods such as IPE, Tigerwood, Camura, Teak, and Mahogany. The Defy Hardwood Stain contains synthetic resins that absorb into the wood leaving a natural semi-transparent finish. Defy Hardwood is a “green” friendly finish that blocks out water and provides long-lasting protection from weather damage. Defy Extreme Hardwood Stain should also be considered for oil-rich woods such as Cedar and Redwood, offering better penetration for these wood types. Exotic hardwoods such as IPE are extremely dense and difficult to penetrate. These wood types when stained, will always fade faster the other woods such as Cedar, Redwood, and Pine. Testing will be changed to 1 year instead of 2 years for exotic hardwoods. – We choose the Defy Hardwood in the Light Walnut color to enhance the natural brownish/red tones of the IPE decking. The IPE looked stunning when the stained was applied but dried a little lighter. Overall a very rich look to the IPE as expected. – As mentioned previously we only test exotic hardwoods for 1 year. Defy Hardwood Stain was one of a few stains that lasted the full 12 months on the IPE wood. About 80% of the original color was left on the IPE. – Being that IPE is extremely dense we expected some wearing of the Defy Hardwood Stain. Overall the Defy did well and small amounts of wearing were visible throughout the IPE on the flooring and steps. 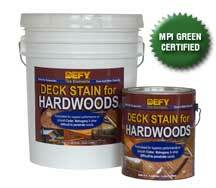 – Defy Hardwood Wood Stain costs $35.99 per gallon. The IPE decking was 450 square feet and we used all 5 gallons for the 2 coats. Costs $.40 a square foot. – No mold or mildew on the flooring surface. A small amount of algae was present in the shaded area. This area seemed to be constantly wet from the bushes and sprinklers. – For a water-based stain, Defy Hardwood penetrates extremely well without any filming on the surface of the wood. Coverage per square foot was not what we would expect with an oil-based stain but on par with similar water-based wood stains. We applied the Defy Hardwood with a brush to the railing and a lambswool pad to the floor. Two coats were applied to the floors. First coat took 2-3 hours athe nd second took 1 hour. – Defy Hardwood Stain did not darken but faded lightly after the 1 year. This would make re-application easier. – Since the Defy Hardwood Stain had faded evenly without any peeling or darkening, it would be easy to apply a wood cleaner to prep the wood. Re-coating should not be an issue since the stain had penetrated into the wood. – We were very pleased with the Defy Hardwood Stain on the IPE decking. Overall the stain lasted longer than most hardwood stains and did not darken or turn black in color. This will make annual maintenance easy for the IPE. I have a mahogany deck & railings roughly 7 years old. I’ve power washed the deck, sanded and hit the surface with 40% ammonia to 60%H2O solution then rinsed thoroughly. I’d like to stain the railings in white; and finish the mahogany deck with a clear or semi-transparent stain. I currently have picked out Flood Pro Solid Deck, True White for the railing system; Benjamin Moore EXT Translucent Mahogany for deck. Good for the railings. Switch the floor stain to Defy Hardwood in Light Walnut color. I'm planning to stain my deck with Defy Hardwoods Light Walnut. Can you recommend the best application method? Brush? Deckpad? I've read that the stain is very runny and drippy and difficult to apply with a brush. FYI, the deck is cedar, and it has weathered for about 15 months now. I've cleaned it with Defy Cleaner and will be brightening it with Defy Brightener. Plan to stain 48 hours or so after brightening. We almost always use a deck staining pad. Rarely brushes and never rollers. Should we paint the deck boards on all sides, before installation, or can we simply install and then paint the top side? Bryan, install and just coat the exposed sides only. We are currently putting in an ipe deck . We are coastal Southern California. Looking for a non toxic stain since our wee ones will be on the deck ALOT. What would you recommend? Michelle, the Defy Hardwood Stain would be a good choice for this. Light walnut color is what we normally would use for IPE. As a suggestion, I would like to propose from a practical standpoint that the category of "Difficulty of Reapplication" not be made in an assumptive manner. As a contractor, I am looking at these reviews with great interest because I need to know what others are experiencing. The review is incomplete in this particular category because I need to know exactly what was done to conduct the reapplication and the results afterwards. Not all Stains are created equal and any darkening whether obvious at the point of determination or not needs to be investigated. I have run into a number of products that color shift with age and need to be removed before another application can be made. The results otherwise had turned out uneven and splotchy due to furnishings on the deck and traffic patterns created by use. These reviews have been quite helpful, but this one aspect didn't help in my overall decision for my customers. Hi, I have a 2nd story balcony made out Massaranduba wood (54’ x 4’). It was build in April 2013. At the time of installation, they lightly sanded the boards with 100 grit paper, cleaned them with a damp rag and gave them a light coat of Ipe oil with another rag on all 6 sides. At the beginning of the summer (June) the wood was looking vey dry and faded on the surface. I re-applied the Ipe Oil on the top surface again with a rag, I did not clean or bright beforehand. It looked great for about a month and then it started to fade and dry again. The balcony is only partially covered and it gets wet when raining. The outer edge of it looks blackened, I guess from dirt and possibly mold. I tried cleaning a couple of boards with a very light solution of warm water/oxyclean and a hand brush, all the gunk seems to come out but it leaves the wood with a whitewash look, not really sure why. Although Ipe Oil has positive reviews, gathering what I have read on this and other sites, I don’t think it was applied correctly in the first place. Still it has not worked really well for me. Nevertheless, I still have some Ipe Oil left. I was thinking of washing it with “restore a deck” cleaner and re-staining it with the Defy hardwood. I was going to use a brightener but I have aluminum windows and doors underneath the balcony and I read that the brightener could corrode the frames. Not sure if that is truly the case. Given that the method of application of the Ipe Oil, Do you think the cleaner would be enough or would it be better to use a stripper? If that is the case, is the stripper safe for the aluminum frames? Sanding with 80 grit would be the last resort. I would greatly appreciate If you could please shed some light on what would be the best course of action for my situation. Acidex, I would strip and brighten for the best prep. Stripper does not seem to bother the aluminum in our experience. If you pre wet the aluminum and rinse right away if any of the stripper or brightener get on it then you will not have an issue or reaction. Hi: Would Defy hardwood stain be suitable for some teak trim on the deck of my boat? The area in question does not get a lot of seawater on it but it does get a little from time to time and it will be near the sea all the time. Thank you. Lori, yes I think that would work well for teak on your boat. Hello, I'm new to IPE and have a 45 x 24 ft deck which is half shaded most of the day, but the other portion is heavily exposed to West Texas hot sun. The current finish of Australian Timber Oil mahogany flame has not lasted 8 months on the sun exposed portion. The finish was done by a contractor and its also a bit uneven. Looking to start again and need some advice on the best approach at this stage. Prep, product and maintenance. Kit, with IPE you will need to reapply every year, sometimes sooner. I would strip off the remaining ATO and brighten the wood when done. Try the Armstrong Clark stain in the Mahogany color. Can you recommend a stripper and brightened? Kit, try the HD80 and Citralic or the Restore A Deck Stripper and Brightener. I have an older pine deck that was painted with the Behr cedar colored product, so it looked like a pumpkin. I have stripped, sanded, and power washed over the last 2 summers. I am finally ready to put a new product on it. Is there a good single coat product? Should I use oil or a water based product? We live in SW Ohio so temperature can range from 0-100- full sun too. Elise, Armstrong Clark makes a single application stain. Look at their semi-solids for best UV protection. For a new Tigerwood deck, which color Defy, Cedar or Light Walnut, would result in the most natural looking finish? Would one have a significant color retention advantage over the other? I'm in SE Massachusetts, lots of sun, heat, cold & snow; Defy a good bet up here? Bill, the Natural Pine color is the lightest and would give a look similar as if wet with water. Defy makes a very good product for you area. The protection/color retention would not be compromised much with the lighter product? The Tigerwood has such an impressive look that the Natural Pine sounds like what I want, as long as it holds up close to as well as the other colors, Thank You. Bill, your wood type (Tigerwood) needs annual maintenance anyhow so I would go lighter this time. You could always switch next year if you want too. Is there anything I can do to fix the blotchy areas we tried light sanding and wiping it but no luck. Deb, you would need to start over from scratch by removing it all. It is impossible to \”spot\” fix. Does the hardwood stain look blotchy the first day you put it on. I'm hoping it looks better tomorrow. Please advise. Deb, it should not look blotchy. If it does then there may be an issue with the prepping or application. 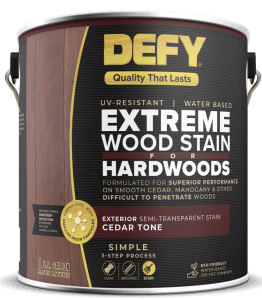 Does the Defy Hardwood Cedar tone color come out the same as the Defy Extreme Cedar tone? I would say so but it does vary in color from different wood types. you recommend. Also can we lightly sand the rough areas? Thank you! Deb, for this we would put two light coats on since it is a year old now. Lightly sand then clean and brighten for the prep. my deck is only four weeks old, built with new western red cedar ( full southern exposure to sun).. Would you recommend one coat or two coats? The deck is 230 square feet plus three steps. How many gallons should I order? Susan, 2-3 gallons at most. only 1 coat for new wood. Make sure to prep first. TWP 1500 versus Defy Hardwood… Which stain is less toxic? Saly Nisley, All exotic hardwood decking will need to be maintained on an annual basis. You should be able to strip and brighten the Rymar instead of sanding. youw would want the Defy Hardwood Stain not the Defy Extreme for Garapa. Hello. I am in Portland, OR and awaiting materials to install a 600 sf Tigerwood deck. I had initially decided to apply Ipe oil to the deck after installation. Now, after reading the reviews of the Defy Hardwood Stain, I am having second thoughts. Is it the case that once an oil based product, Ipe oil is applied, the water based Defy stain will not penetrate the wood, say, one year later. Alternatively, if the water based product is initially, will the oil based product penetrate. My thought would be to apply the water based product initially and use the oil based product later……. The question boils down to: once you use either a oil or water based system, is it best to stay with that system? Rick, You should not apply a water based stain on top of an oil based stain or vice versa. The positive is that both IPE Oil and Defy Hardwood are easily removed with a stain stripper if you want to switch. In addition they will both need to be done annually due to your exotic Tigerwood so maybe a deck cleaner may even be enough prep to switch. Have a mahogany deck that was stripped, sanded to bare wood and coated with Australian timber oil in flame mahogany color. Deck Is protected by roof. Color looks pretty good but seems not the best product that I could have chosen even though I did a lot of research for treating mahogany. Can I use this Defy hardwood stain? Have a second deck of new mahogany that is in sun with no roof or overhang that was also treated with the Australian timber oil and that has faded very quickly. Would also change that to something that is better for longevity and low fading and mildew resistance. Karen, If you want to switch brands then you should strip it off again down to the bare wood. Defy Stain is a very good stain but cannot be applied on top of Cabot ATO. I personally would look at the Armstrong Clark Stain in the mahogany color.